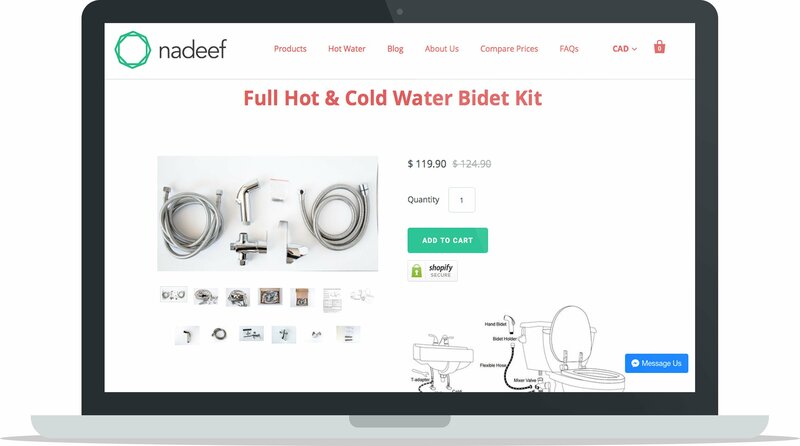 In this ecommerce business case study, learn about Nadeef, a hand-held bidet company servicing the North American market where there’s demand for bidets, particularly from consumers coming from Middle Eastern and Asian backgrounds, but with very little supply from conventional stores to meet the demand. 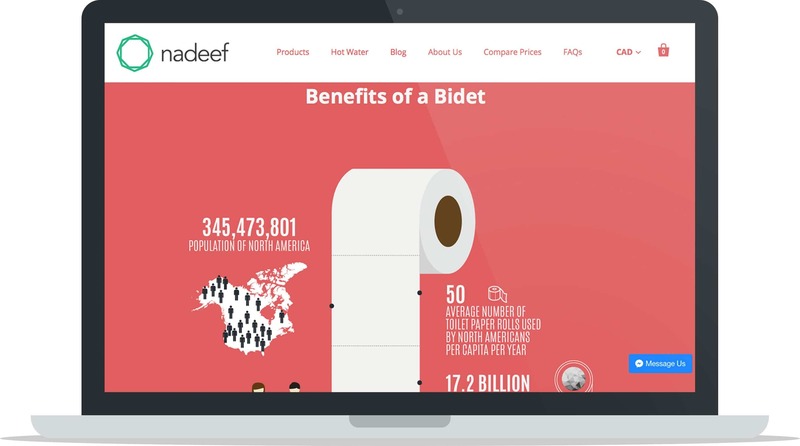 Stemming from the founder’s need to find a product that met his and his community’s standards, Nadeef helps customers maintain personal cleanliness and reduce toilet paper consumption all whilst being a cost-effective option that’s easy to integrate into existing bathroom appliances. Learn more about how the founder sources the product, the best tools he uses to help run the business and how he’s managed to get customers to love doing business with him so much that they ask him to sell products he don’t even sell. Why did you start Nadeef? Where did you get the idea for this business? I started the business because I had a need for the product myself. I grew up moving around a lot in South Asia and the Middle East where hand-held bidets were very common. Virtually every bathroom had them. So my own personal standards, and the standards of my family and close friends growing up, in the bathroom required the use of a bidet. What was great in terms of giving me the idea to start the business here in Toronto, Canada, is the fact that we have such a high immigrant population from that part of the world. It’s not just me and my friends that have a need for this product, but also the hundreds of thousands of people who immigrate to our country each year. Bidets are very, very common for the majority of the world’s population so I was confused as to why it was so hard to find them here in Canadian stores. Home Depot – a home hardware store- is the only other store that is selling them (many times only seasonally and not in all locations) and even their product has an odd design and is quite expensive. So seeing that there was a lack of awareness as well, here in Canada, was another reason for me to start the business. 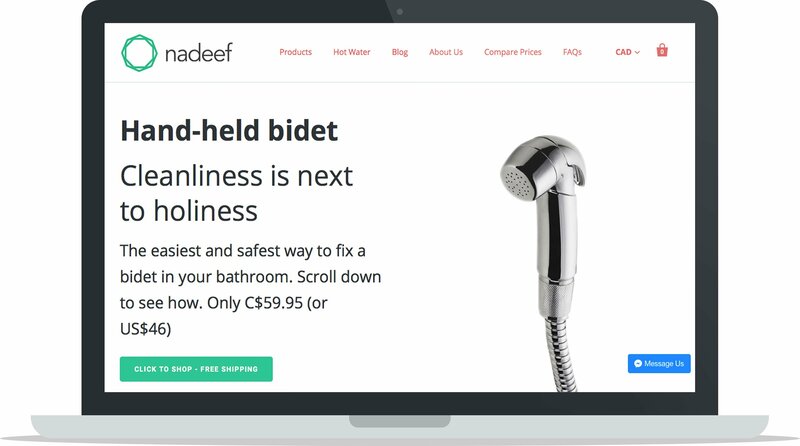 I also did some research as to why bidets haven’t become commonplace in North American bathrooms and although there wasn’t any explicit reasons for it, I was able to figure out a few things. The biggest thing I learnt, however, is the level of profitability in selling toilet paper. For the big conglomerates that own the everyday household brands we all have in our homes, toilet paper is one of their most profitable business units. Because not only is it one of their highest margin products, but because people consume it and need to buy it again and again. The thing with bidets are, they heavily decrease the amount households need to use toilet paper. I found that in a 2009 study, the average American uses 57 squares per day, and they spend $6 Billion per year on toilet paper. That’s significantly more than any other country in the world, even those with much, much, much higher populations. And most of those countries use bidets or water substitutes so they don’t need more than a few square per day. Basically, not only did I want to start the business to service my own need and my community’s need, I wanted to help decrease the world’s paper consumption. I found manufacturers on Alibaba (check out our Guide to Safely Sourcing Products from Alibaba) and just collaborated with them. I had ordered samples from several established bathroom appliance manufacturers, stress tested several different models, and found one that I really liked. There was a slight modification to the design I had to make to make them fit North American bathrooms, but that was about it. We’ve had challenges mostly in stress testing because we need to make sure the quality and the materials are of high durability. It took a while to stress test everything. I basically used the products myself over several months just to make sure it worked well. The challenge there was the long timeline I needed to wait before I could feel confident with the manufacturer. I target my product to my immigrant community. 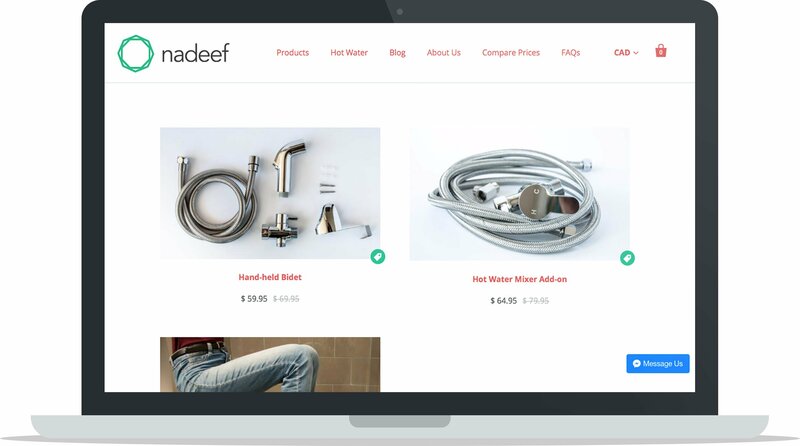 Nadeef means “Clean” in Arabic, so a Middle Eastern or South Asian buyer can recognize the name as one befitting their culture. My target market understands that we know their needs and so they trust us. Trust is big. It’s not only trust in understanding their pain point, but trust in our brand itself with regards to on-time delivery, warranties, customer support, installation help, etc. When you first launched your product, did you have an audience to sell to right away or did you build your audience as you went? How have you continued to build your customer base over the years you’ve been in business? Not really. But I knew who I wanted to reach. I knew Facebook Advertising had a feature where I would be able to target expats, or people who speak different languages, or people who were born in certain parts of the world. So I built my audience initially through Facebook ads, by targeting people who fit the immigrant profile. Now we don’t do any paid advertising, we are mostly generating traffic from organic search. It’s not as high volume of sales as when we were paying for ads, but our profitability per sale has gone way up, and it gives me time to focus on other things I enjoy doing. I just use Shopify’s shipping feature, it’s really easy to use. I have a Dymo 4XL label printer which just prints off my shipping labels and there is a Canada Post across from the office, as well as very close to my home, so it’s convenient to just drop them off myself. As our volume continues to grow where I cannot manage myself, we will probably look to FBA for shipping. We use Shopify for most of that. Everything is in one place. Other than that, I use a physical Kanban board to keep track of my daily and weekly work items. Which marketing channels do you find the most lucrative (your own social media, working with influencers, email marketing, referral marketing, paid advertising, etc.)? Do you have any core tools or resources you’ve used to grow your business that you wholeheartedly recommend, or any particular marketing strategies you’ve employed to grow your business? Facebook’s channel has been huge. As I mentioned, it’s been very easy for me to target my customers through it. Kijiji has also been very, very good. It’s like eBay and Craigslist put together and it’s big in Canada. But I love the Scout app more than anything. Full disclosure: It’s an app that a friend of mine and I built together, and then we partnered with Richard of A Better Lemonade Stand to take it through the final lap. 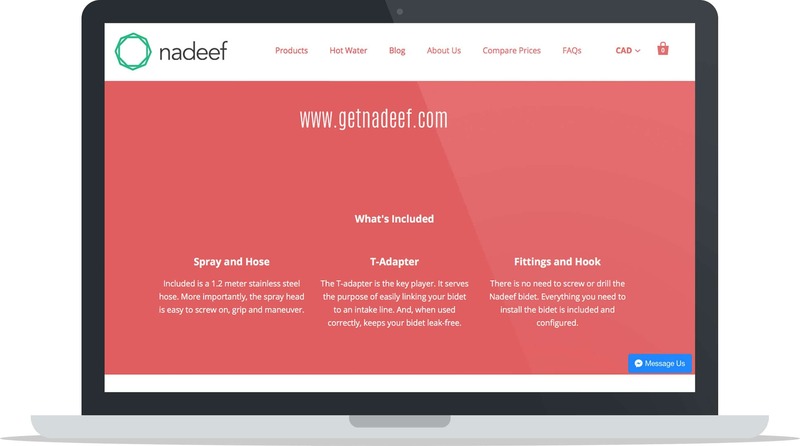 But the idea for the app arose out of a need from managing and growing Nadeef. Like I mentioned earlier, it’s been my customer relationships that have allowed me to differentiate my product from competitors. Other competitors won’t call or text a customer just to say “Thank you,” or just to ask if everything is working fine. I even call customers who abandoned their checkouts (after they submit all their personal and contact details, of course) to see if there was anything else I can help them with. This level of personalized service has done wonders for my business, so I knew I needed help in automating some of it. So my friend and I built Scout, originally as an abandoned checkout recovery tool. Basically, it’s a Facebook Messenger chatbot assistant and it alerts you through a chat when someone abandons their checkout (and now when someone re-purchases or spends a lot of money on your site) along with one-tap buttons to automate an action. When I started calling my customers through Scout I started to recover over 55% of my abandoned checkouts. But what’s more important is that one-to-one customer conversations gave me new insights about my customers and the market which helped keep me on my toes in terms of better, non-traditional marketing tactics. 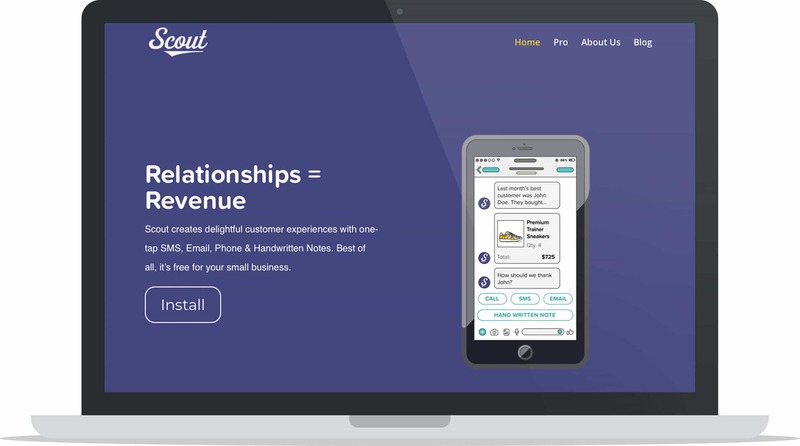 Note: Check out our Scout Review to learn more about the app and what it does to help businesses build relationships with customers and increase conversions. Facebook Ads helped me make my first 10 sales, and Facebook and Kijiji listings probably also got me to my first 100, as well. But I’d say for the first 1000, it was very much due to word-of-mouth from existing customers telling their friends and through organic Google search. I think the biggest failure so far has been my inability to give it 100% of my attention. It started as a side-hustle when I had my full-time job, but even after I quit my full-time, it didn’t become 100% for me because I’ve since start focusing the majority of my attention on building ecommerce apps like Scout, as I mentioned earlier. 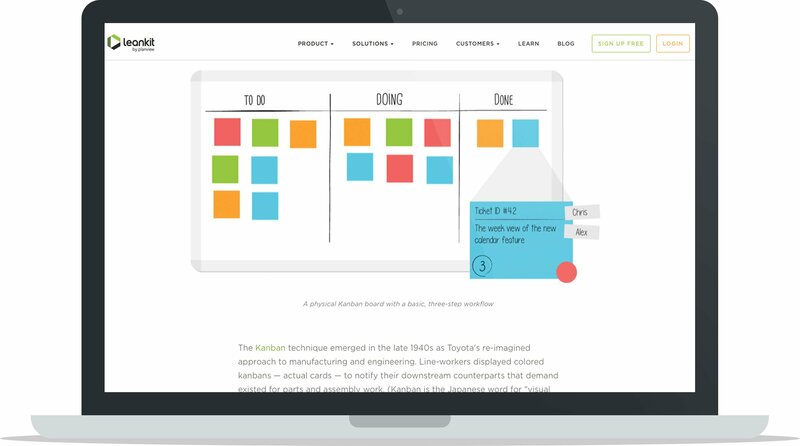 I think the biggest success is the fact that we’ve found product-market fit so quickly. The fact that I started making consistent, and growing sales, since the first week of launching the store. I think it’s easy to forget that’s not a common occurance, many times a new business will have to go through lot’s time time to figure out what sells, and how best to sell it. For Nadeef, we were able to answer those two questions within a week. The biggest thing you need to focus on is customer service and experience. It’s all about building a trusted relationship with your customers. Once they trust you to solve their problems and that you know what you’re talking about, they will come to you to solve all of their problems. They’ll even ask you to start selling them things you don’t even sell. I’ve had many customers ask me to sell them all sorts of other home appliances because they like doing business with me. Once customs trust you to solve their problems… they will come to you to solve all of their problems. They’ll even ask you to start selling them things you don’t even sell. As far as Nadeef goes, I’d like to be selling a wider range of higher end products that are made in Italy by the summer. But, more broadly, I’d like to continue to build my own apps to grow Nadeef into a $500,000/year business. And I hope those apps also help thousands of other entrepreneurs like me, too. Failing at my first business. The lesson I’d like to share here is that your first business is likely to fail. And that’s quite alright as long as you see failure as a smaller piece of the larger framework for success. The first business (and in my case, my first three) is a burner. You learn from it so that your next one is better set up to enjoy success. I don’t believe that the majority of us are even ready to handle success even if we got it on our first try. A very close friend of mine got me hooked on etymology, which is the study of the origin of words. I looked into the word “travel” once and I found that it’s influenced by the French word “travailler” which means “to work”. So basically, it can be concluded that traveling used to be a form of “work.” If you think about it, back in the day people would only travel if they really needed to, for work, for example, because it was a hard thing to do. No one traveled for fun. Traveling was hell. So for example, if you wanted to be a dentist, and there wasn’t a dentist in your village, you had to travel to the next village to become an apprentice for an established dentist. And if you got to that village and it turned out the master already had an apprentice or wasn’t able to teach, then you’d have to travel again to another village. While traveling you would need to live in people’s homes, offer to do work to earn your keep, etc. By the time you found a dentist able to take you on as an apprentice, you might have been traveling for months, an experience in itself of growth and maturity. And so reaching the master dentist was tough work. But going through that “travel” set you up for success. If you could survive through that journey and keep going, when you finally found a master to take you on, it would mean you were ready to learn and be successful as a dentist. I think this lesson applies to entrepreneurs today. I think entrepreneurs are the real “travellers” of our day, if you’re basing it on the origin of the word’s meaning. Your first few trials are like the first few villages you had to travel to. The fact that you failed means you’re more ready to handle success and deal with success properly. If you had found the “village” on your first try after just a couple hours of traveling, then you may not have experienced enough hardship to truly appreciate the opportunity and be mentally prepared to be a pro. Failure comes in handy when you are starting to feel success, and it also teaches you what’s important. I think failure makes you humble. It brings you back to earth and aligns your expectations for yourself of how much work you really need to put into something in order for it to work.